Last week saw the anticipated release of MATE 1.8. 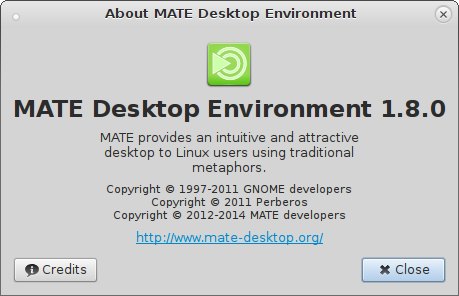 This new version of the MATE desktop will be featured in Linux Mint 17 which is planned for the end of May 2014. On behalf of the Linux Mint project I’d like to thank and congratulate the MATE development team and I’m excited to echo their release announcement here on Segfault. Great news. I see that Tiling / Snapping have been implemented from Cinnamon to MATE. Any plans for some MATE improvements to be incorporated in Cinnamon? (Eg: Added a progress bar to the logout dialog or Cinnamon paste tool). I am not a devloper but suppose it is not exactly trivial / copy-paste but feel still porting from GNOME derivative (gtk) may be easier than KDE (Qt). Even Wayland support for MATE could pave a way (relatively easy in terms of some amount reuse vis-a-vis MATE not having wayland support) to Cinnamon as well. Glad to hear your views. I’m not sure it will fit in the roadmap for 2.2, but yes, as a general rule of thumb a lot of ideas and inspiration are exchanged between projects, especially between Cinnamon and MATE. I know we utilise a user guide based on the MATE desktop, but I would love to create a Cinnamon version as it’s the flagship desktop for Mint. Also, there are now so many features specific to Cinnamon that a new user would appreciate documentation that is specific to this desktop. Is there anyone on the development team leading the documentation activities to discuss this with? It will of course at some stage. I am currently running Mint 16 KDE but would love to try MATE 1.8 now. Is it available in backports, or how would I install it in Mint Mate 16? Thanks. One more thing; please add sound effects to Linux Mint 17 Mate edition like on Cinnamon. Will Mate 1.8 be backported to LinuxMint Maya (13)? Hi, I really like Mate and the way it is going. I use Linux Mint Mate mostly on my netbook with a naturally small screen and I like simplicity. Therefore I prefer the simple Mate menu to the Mint menu (which takes up half of my screen and adds extra steps to get to all applications if you don’t want lots of stuff in your favourites). There is one feature though that I really miss when using the Mate menu instead of Mint menu: the super-versatile search function. In Mint menu you can for example type the name of any package and if it is in one of the repos, an option to install it will appear – that is so much quicker than going through terminal or synaptic. Is there any way this feature could be included in the Mate menu in a future Mate release or is it already possible by adding a custom script or something that I haven’t noticed? Thanx and keep up the good work! Just installed Mint ‘Mate’ 17 on Compaq Presario R3000. The best distro I have ever used. I want to congrats you for adding IEC units to Caja. In my opinion this should be the default. Anyway, I can’t find the option to change it to IEC from SI.